The Ultraman entrance to Tokyo's Ultraman Street greets you, dear listener, for this episode raises its beta capsule and unleashes a whole lotta' Ultra on you ears! So this month, our film under the Daikaiju Discussion microscope was Ultraman Tiga, Ultraman Dyna, Ultraman Gaia: Battle in Hyperspace. With the craziness of just getting back from my big Asia trip (I’m definitely wiped out and I think you can tell in this episode) and the Halloween weekend, I decided that T’Igor and I would keep this viewing low-key and just watch this meta Ultra film on our own (breaking it down as best as we can). 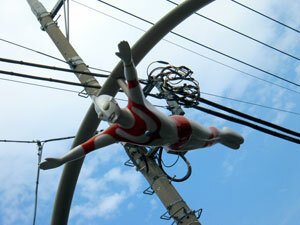 Honestly, I just don’t know much about Ultraman. I have seen most (I think) of the first series, but none of the others. When Ultraman Tiga was on Fox, T’Igor and I tried to watch it as much as possible, but it’s not really my speed. Regardless of my Ultra-feelings, I did find the movie enjoyable in some ways. We didn’t actually get any real discussion submissions for this one (which wasn’t a surprise), you’ll hear what I mean. In addition to the movie, I played a number of requested Ultra music (that was tossed out there for the FB fans). Is it just me, or are the intros super long to these shows? Also, sorry the quality of the English intro isn’t better. I seem to only have a high quality version of the Japanese song. And of course we had some news and local events, too! Fantastic news, everyone! 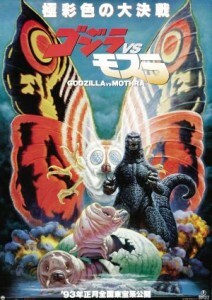 Our next film in the discussion-lineup is the 1992 Godzilla vs Mothra! If you own this on DVD, you might be more familiar with it’s US Home Video title, Godzilla vs Mothra: The Battle For Earth. Slightly laughable, I know, but we’ll be watching a subtitled version of the film because (quite honestly) that’s my preferred experience. I’ll try and bring back the KaijuLiveTweets for this one too. If you want to participate in this month’s discussion, just make sure you turn your homework in before November 27th. Just send me an email with your thoughts, questions and reviews – don’t forget to make the subject-line “Daikaiju Discussion” so I can find it easily. Congrats to our big winners of the FEEL THE IMPACT contest: Derek Hendricks, Kevin deAntonio and Adam Armour! And mega-huge thanks to the sponsor of that contest, Impact Merchandising. Make sure you check out their webstore where you can buy all sorts of awesome Godzilla-themed shirts! Join us next month where I’ll distill my (very) recent trip to Japan!